Baking a cake for the Feast of Our Lady of Lourdes is a great activity for a number of reasons. First, we are celebrating an important Marian apparition, and having cake is one of the ways our culture marks a special occasion. 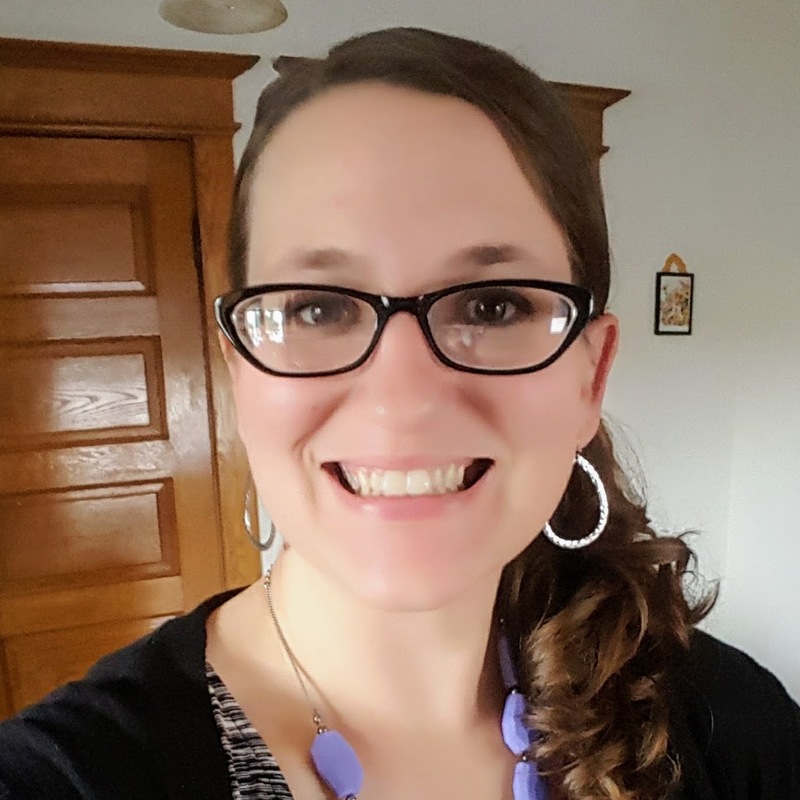 Second (and perhaps more importantly), it’s a great catechetical tool for helping our children remember the story of Bernadette and Our Lady of Lourdes. As you may recall, Mary appeared to a young French girl named Bernadette Soubirous between February 11th and July 16th of 1858. On one of these occasions, Mary instructed Bernadette to dig into the ground at the site of the apparition. Heeding Mary’s direction, Bernadette dug with her bare hands and uncovered a fresh water spring that still flows today (producing more than 30,000 gallons of water daily) and has healed innumerable pilgrims in the 150+ years since Bernadette uncovered it. As you will see, the design of this cake not only allows your family to recreate the Grotto at Lourdes, but the act of eating it (or “digging in”) is reminiscent of Bernadette’s own obedience to Our Lady who instructed her to dig and drink from the stream. Gather the ingredients. Box cake mix. White icing. Green food coloring. 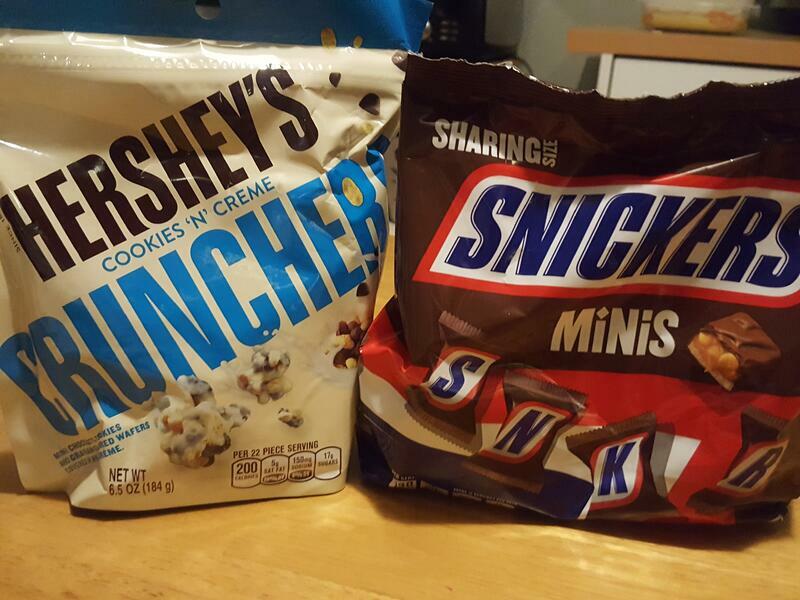 Mini Snickers. Hershey's Crunchers. Bake the cake. We use box cake because, let’s face it, the easier the better with small children. But feel free to use a homemade recipe, too. Bake the cake according to the directions. The chocolate cake represents the “dirt” Bernadette dug up to reveal the spring. Let it cool. When the cake is finished baking, let it cool before icing. This is essential so the icing doesn’t get too runny. Cover with green icing. 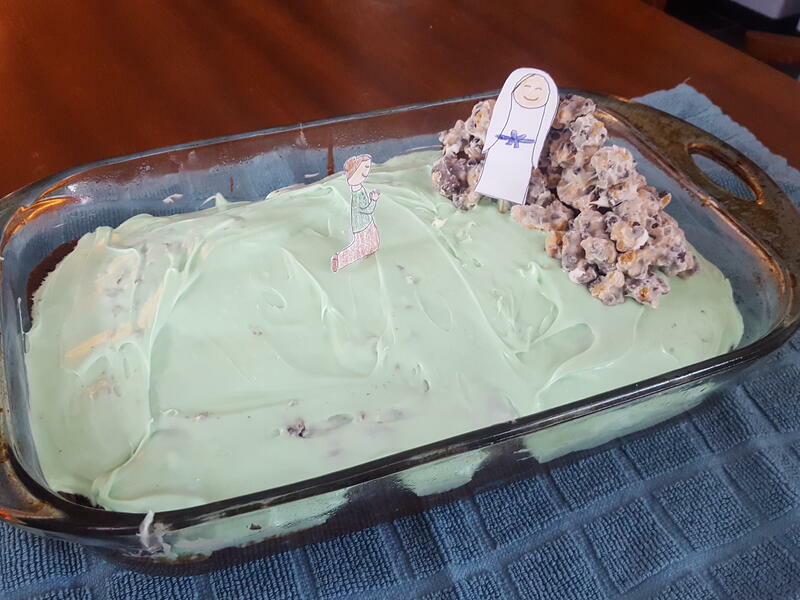 Cover the cake with green icing (or white icing dyed green with food color) to represent the grass Bernadette dug through to find the spring. 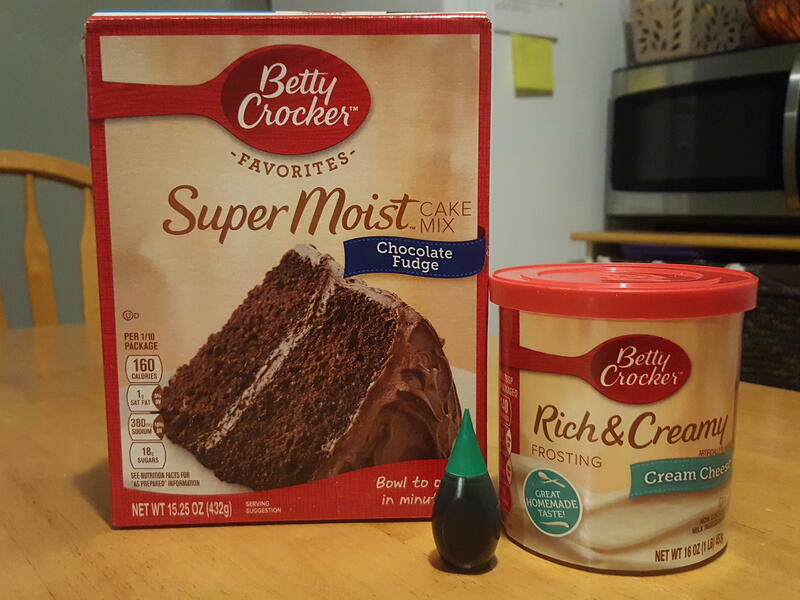 Make sure to leave a little extra icing to use in another step (about 2 T. worth). Feel free to add sprinkles or other decoration as flowers for Our Lady. If you don't have time to bake a cake, you can always buy one and decorate that instead. Now, it’s time to build the grotto. Make the foundation. 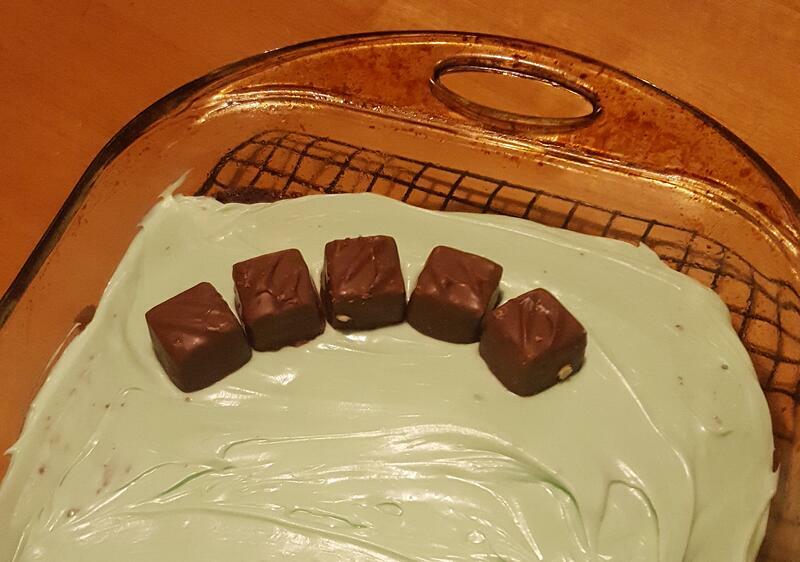 We use the Mini Snickers as the base and arrange them in a semicircle like this. Build the walls. We use Hershey’s Crunchers to cover the Snickers and construct the grotto. 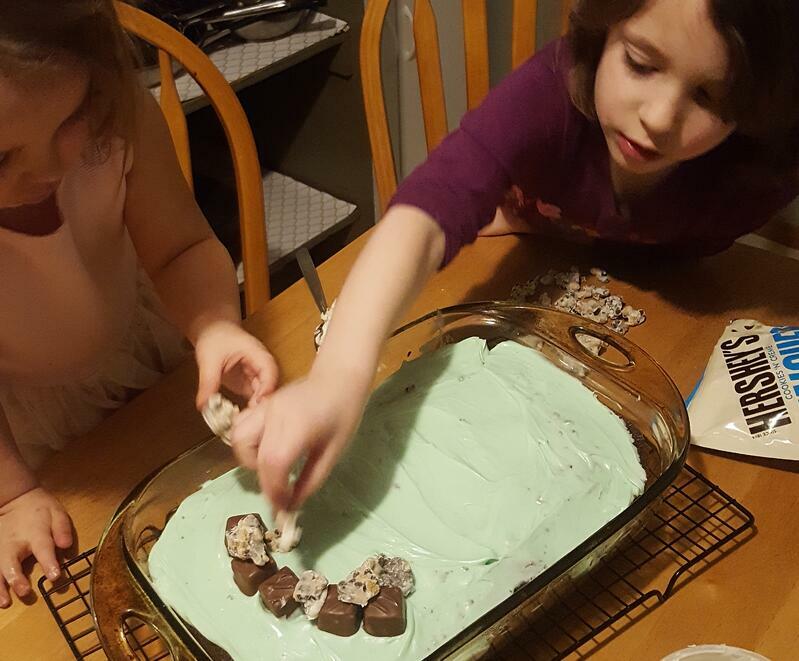 We made sure to use the leftover icing as “glue” to layer the candies on top of each other. Make Mary and Bernadette. 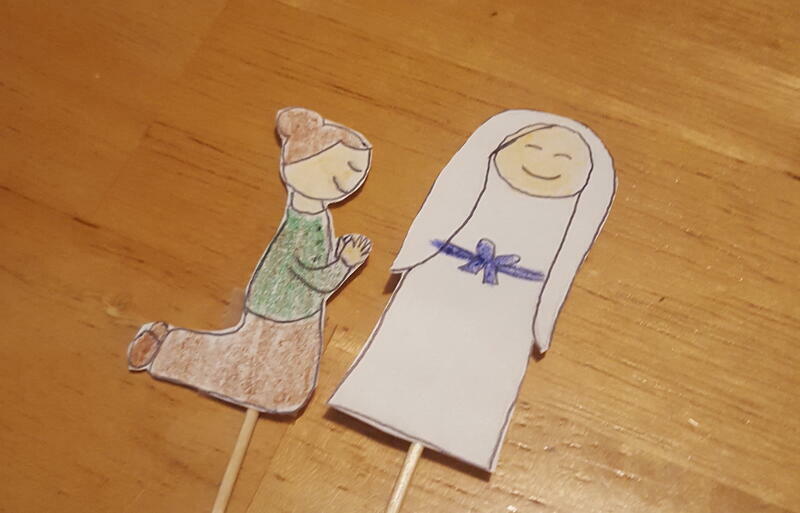 Once the grotto is constructed, use small paper printouts/drawings of Mary and Bernadette, attach them to toothpicks and position them on top of the cake. We place Mary in the grotto and Bernadette just outside praying. Enjoy as a family. Here is our finished product! 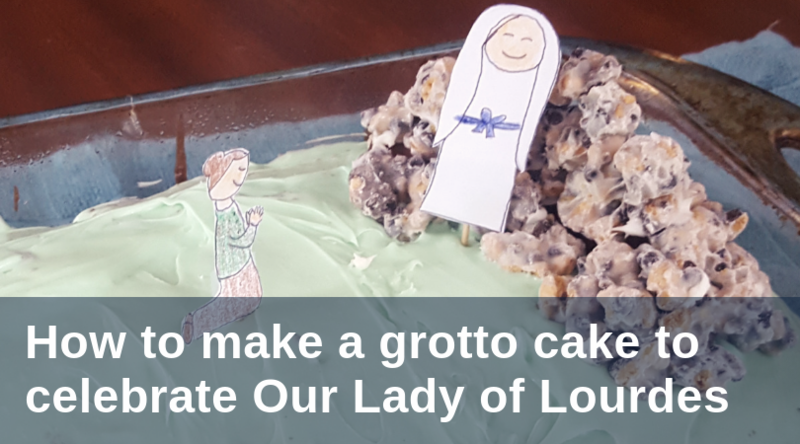 My children absolutely love this activity because of the creativity and skill involved in crafting the grotto and getting to see the two saints on the cake. The fun from this activity will be a great memory for your family as you learn the story of Lourdes along the way. If making the grotto cake is just too much right now, you have some alternative options. You can buy a cake already made and decorate it with sprinkles and icing. Or, you can turn to my go-to treat on Marian feast days: cupcakes. Usually, I get white cupcakes with blue frosting or blue sprinkles to represent Mary’s mantle. In any case, your family will enjoy honoring Mary with yummy sweets! Check back tomorrow when I will share more ideas for honoring Our Lady of Lourdes with your family. If you have any ideas of your own, please share them below.